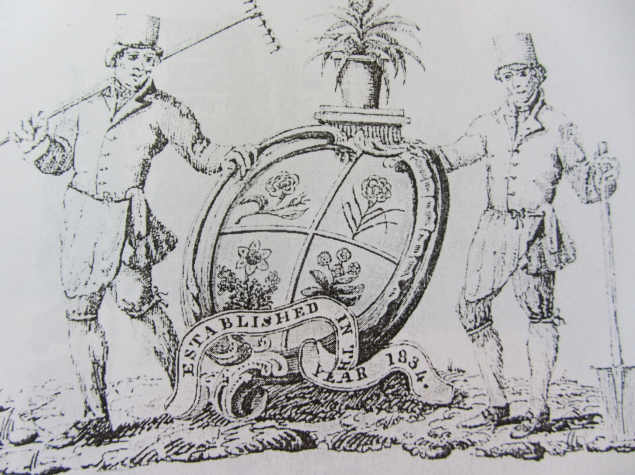 The Westmeath Horticultural Society was founded in 1834 by local landlords such as the Marquis of Westmeath and Sir Richard Levinge. It collapsed after the Famine but was revived later and the Mullingar Agricultural Show is now one of the highlights of the farming year. 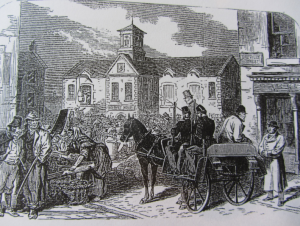 Mullingar Market House in 1870. It depicts the social and political themes then prevalent–landlords and tenants and townspeople buying and selling produce. The street name recalls that the entire town was sold to Lord Greville after the Famine. Catstone on the historic hill of Ushnagh. 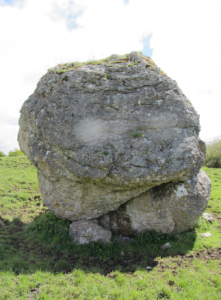 This glacial erratic is one of the iconic images of Westmeath. It is surrounded by a Ring Barrow and symbolised the historic mid point in Ireland thus getting itself the moniker -the navel of Ireland. Many historic personalities including Daniel O’Connell and Eamon DeValera addressed their followers at this important site. 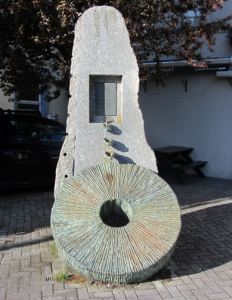 Memorial to the Great Famine in Dominic Place, Mullingar. Designed by Gerald Leslie and funded by the Town Commissioners it is based on the idea of a sculpted mill wheel which recalls the origin of the towns name; the outstretched hands portrays those who sought or gave help during this difficult time in the town. Thousands emigrated from Westmeath to Argentina before and after the Famine. 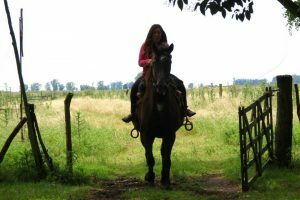 Most settled on the Pampas and acquired huge sheep farms. The sons and daughters of strong farmers formed the backbone of this migration and the two countries maintain links down to the present day. 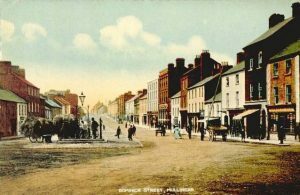 Mullingar in the early twentieth century. The motor car was a novelty and a lot of commerce was transacted on the side of the street. Apart from modes of transportation little has changed in Oliver Plunkett Street. 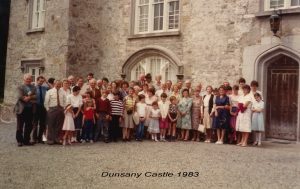 Society outing to Dunsany Castle 1983. 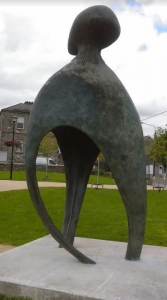 Sculpture called ‘The Game Piece’ by Irish artist Sony Mac Manus located in the people’s park opposite the new Civic Offices in Mullingar. The game pieces which provided the inspiration for the artist came from Lough Sewdy and Ballinderry crannog both in Westmeath.